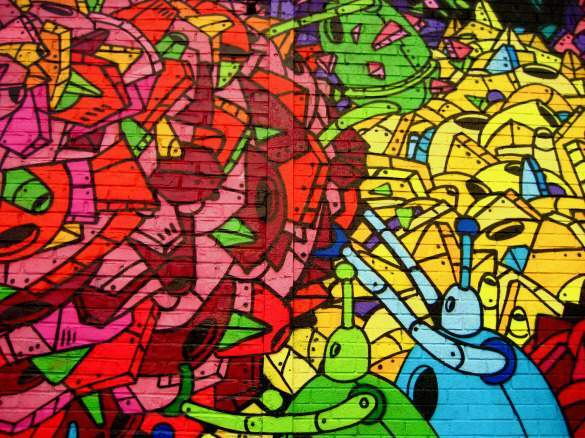 Once vilified, street art now carries a vast amount of cultural cache. Gone are the days when spray paint on a wall signified blight; today you’re as likely to find a wheatpaste or woodblock inside a gallery as outside. Pieces by renowned artists like Banksy and Swoon fetch thousands of dollars and are collected by rock stars, actors, and museums. 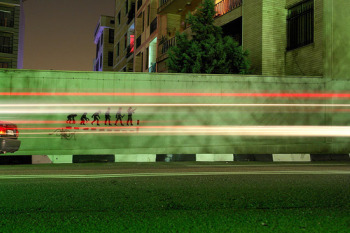 Street art has always been cool, but in the twenty-first century it’s become an art. Nevertheless, the best place to see street art remains the street. Around the world, street artists express emotion, give voice to the marginalized or downtrodden, protest, or simply create beauty. They use a variety of tools, including yarn, stickers, magazines, found objects, tiles, LED or laser displays, and brooms, as in the case of “reverse graffiti,” in which a dirty area is cleaned such that the removal of dust or detritus forms an image. 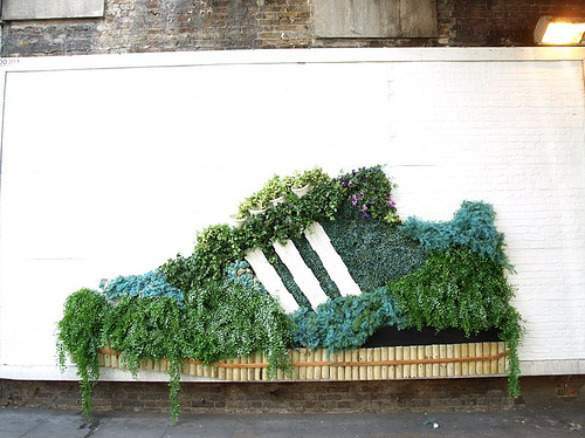 Most of the time, street artists don’t have permission to put their work up in public spaces. 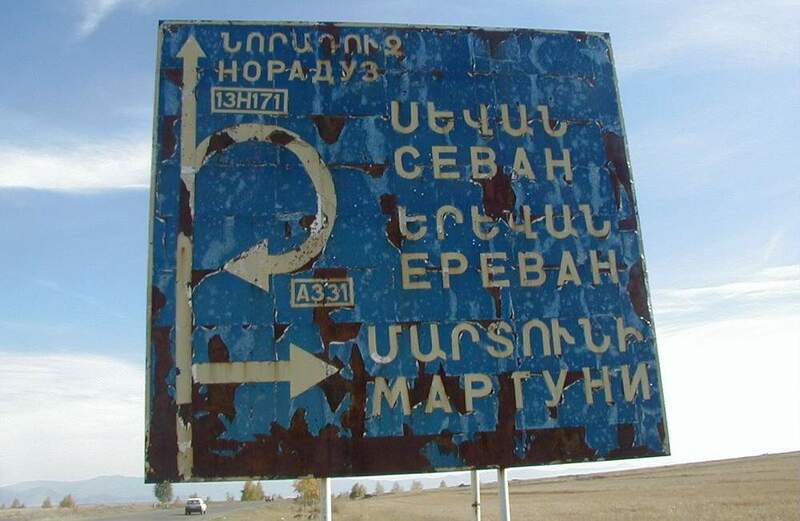 The following cities are noted for their art and artists. Any city likely has some street art, if you know where to look. Spying a poster or tiny mosaic is a reward for anyone who begins to really interact with his or her environment. So walk down those alleys and peer behind those signs; you never know what you might see. The here-today-gone-tomorrow emphemerality of the pieces is part of their charm. 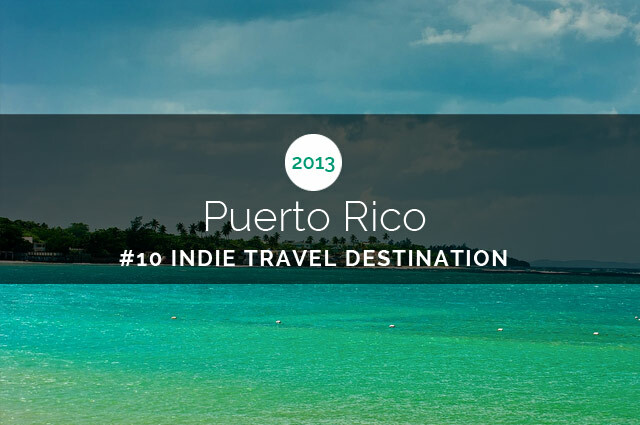 No place in the world is as closely associated with graffiti as New York City, and no place on this list has such a vibrant, diverse scene. If you had to choose one city to visit in order to learn about street art, New York should be it. The splashy throw-ups (bubble letters) of the 1960s and 1970s have given way to wheatpastes (drawings, usually made elsewhere, pasted to walls), stencils (paint sprayed over a template that’s been carved or cut to form letters or shapes), clay imprinted into pavement, and every other medium imaginable. From Shepard Fairey’s Obey Giant stickers to Neck Face’s deliberately awkward tags to Banksy’s fake pet store in the West Village to Swoon’s lovely life-size portraits of people, every street artist worth his or her aerosol has worked in the five boroughs. TrustoCorp hangs custom-made street signs with cheeky aphorisms like “it’s okay to play with yourself,” and an unnamed artist covers the city with enigmatic BNE stickers, his commentary on living in a world saturated with advertising. 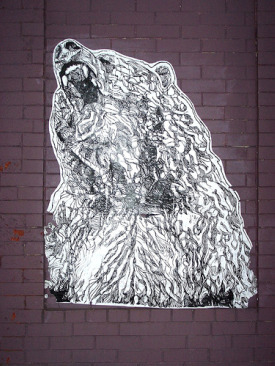 Gaia pastes plaintive animals and people, spooky, semi-realistic likenesses. Murals by Tats Cru, among others, decorate the Bronx, and mash-ups of ads and art by Poster Boy often show up in subway stations. What unifies the city’s various pieces is their sense of possibility: if you can make art here, you can make it anywhere. Like New York, Berlin has a thriving established art scene. Not surprisingly, Berlin’s street art culture is equally alive. Artists from all over come to show their stuff, particularly in what was once communist East Berlin. Neighborhoods like Mitte and Friedrichshain-Kreuzberg are full of examples new and old. Berliner Strassenkultur, as it’s called, embraces graffiti (very loosely defined as the writer’s name, or tag, done quickly with markers or spray paint). 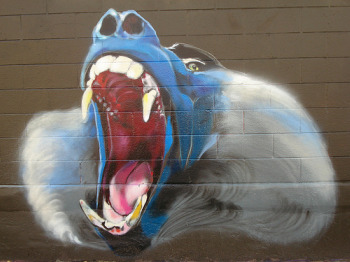 Alternative ways of saying “I was here” include multihued murals by Los Angeles–crew CBS and gigantic monsters by Blu, an Italian artist. Of course, signing extends to the locals. El Bocho leaves behind a cutout paper doll known as Little Lucy, in addition to tape art (exactly what it sounds like). A single fist, the signature of local artist Kripoe, appears throughout the city, most spectacularly on a sign in the middle of the River Spree. 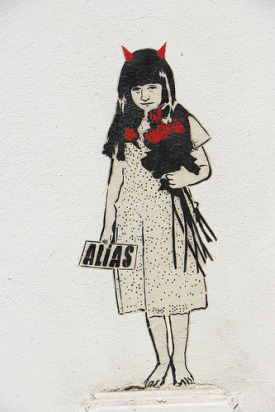 And both XOOOOX and Alias incorporate their names into posters and stencils. Even as street art has become more technically savvy, for many artists, it’s still all about the name recognition. 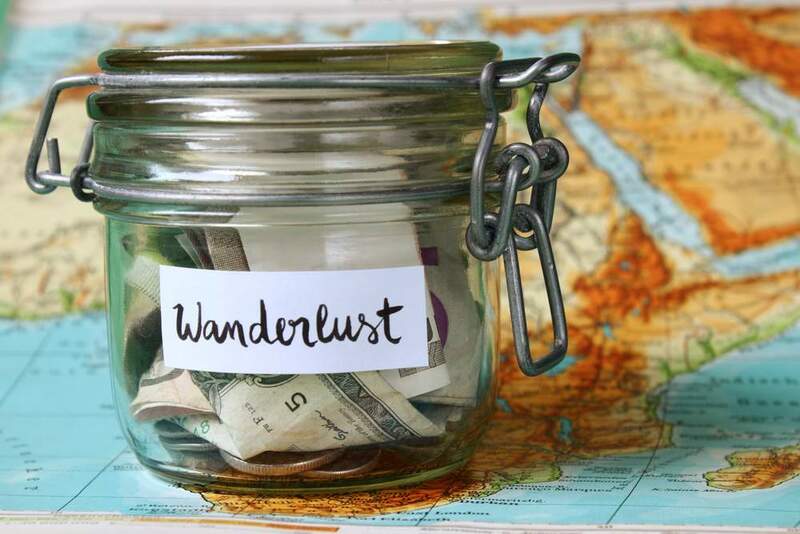 >> Find airfare to Berlin, look for budget hostels in Berlin, and read our indie travel tips for visiting Berlin. Antigraffiti laws notwithstanding, a receptive public has helped the London scene flourish. In 2008, the Tate Modern held an exhibition of work by six international artists. Beloved pieces, including satirical stencils by Banksy, are regularly protected by official means (such as sheets of plastic) and unofficial ones (agreements among artists). So a recent feud between Banksy, a prolific artist with profitable gallery deals and a movie that debuted at Sundance, and King Robbo, who helped create the street art scene in the 1980s, has sparked a lot of emotion. The Times has compared their rivalry to that which existed between Picasso and Matisse. In 1985, King Robbo painted a mural in Regent’s Canal, which Banksy covered with a worker putting up wallpaper in late 2009. Robbo then came out of retirement to alter the image such that it appeared as if the Banksy stencil was painting the older artist’s moniker. In early April, the image was altered again, a play on the word “king.” But, as this photo shows, the fight continues. Among the best neighborhoods for seeing street art, creatively combative or otherwise, are Shoreditch and Camden, in London’s East End. Ben Slow paints thoughtful, slightly romanticized images of women, including a mother and child in Brick Lane. Slinkachu leaves tiny, easy-to-miss-or-crush figurines on the ground. Adam Neate has scattered quickly executed portraits on cardboard around the city, free for the taking. Elaborate, often unsigned stencils in black that provide a wry or ironic commentary show that, despite intense criticism, Banksy remains a pervasive influence. 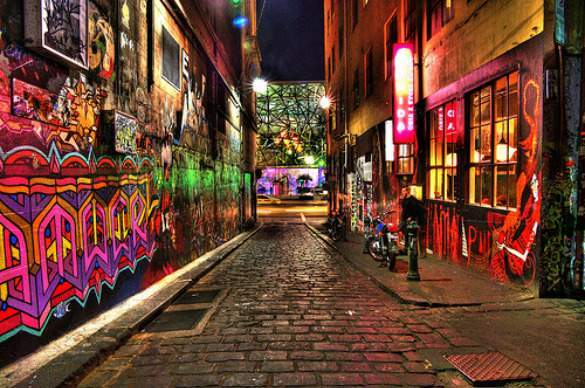 Starting around the millennium, the laneways of Melbourne underwent a change—from nondescript alleys between streets to destinations in their own right. The architecture stayed the same, but the decorations had altered, radically. Almost overnight, an impressive urban art scene erupted. 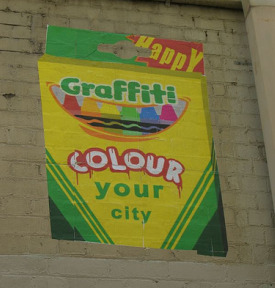 A few years later, the city hosted a stencil festival, now an annual event, cementing Melbourne as a hub for this particular form. An ever-changing mix of posters, paint, paste-ups, stencils, and stickers covers Hosier Lane, in the city center (above). In addition to the CBD (Melbourne’s Central Business District), nearby suburbs, including Northcote, Brunswick, and Fitzroy, also boast distinctive displays. An oft-repeated Vexta stencil features two skeletons kissing; it’s appeared in pink and black as well as neon green and red. She also does diving figures, with feathers instead of hands. Ha-Ha, whom Vexta has cited as an influence, frequently stencils robots, using paint rollers. Miso’s stickers and posters have graphical elements like repeating swirls or realistic figures; she often collaborates with Ghostpatrol, and his nostalgic images of small, fat-faced people or anthropomorphic animals contrast with her stylized work. 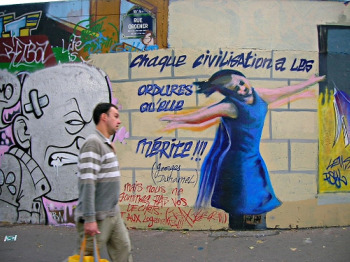 It might be uncool to say, but street art in Paris can be very charming. A wheatpaste of a sultry lady looms over a garden. Figures kiss or dance. Small, bright mosaics by Jérôme Gulon dot street corners. Invader’s tile art portrays characters from video games, such as Space Invaders; he makes art with Rubik’s Cubes (called Rubikcubism) as well. M. Chat’s yellow feline began in Orléans, then moved to Paris, where it bestows its silly grin from many locations, especially high up the sides of buildings. Some pieces, including several in the 19th and 20th Arrondissements, can be very pointed, documenting the difficulties faced by the indigent or immigrants. Stencils by Jef Aérosol show children and women huddled and cold, with bright red arrows alongside to flag the attention of passerby. His work, like most sardonic stencils, owes a debt to Blek le Rat, especially his scampering rats and homeless people from the early 1980s. Fafi’s caricatures of hypersexual girls present another type of politics. 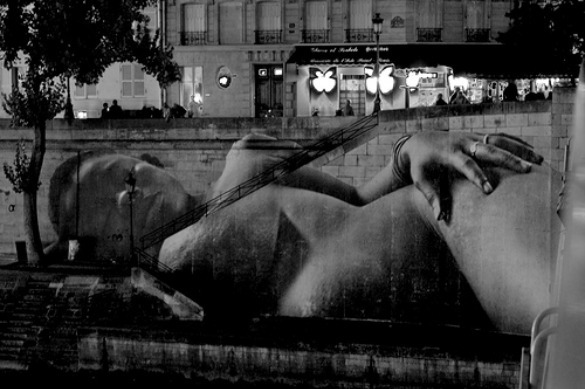 JR creates ginormous pastes from his photographs of people; the image below was pasted to the Pont Saint-Louis, part of his Women Are Heroes series, in 2009. Not content with making the A in “LA” stand for “anarchy,” London–based D*face put up statues with exposed viscera in the shape of the iconic Oscar during the 2010 awards season. An attempt to bring reality (the sinew and messy stuff of life) into the fantasy that is LA-LA Land describes a lot of work here. Pastes by Mr. Brainwash play with our idea of celebrity: Mr. Spock gets decked out as a heavily made-up blonde, Obama becomes Superman, Elvis lovingly fondles an automatic weapon. (The making of Mr. Brainwash—or how an amateur French filmmaker named Thierry Guetta became a street artist—is the subject of Banksy’s 2010 movie Exit Through the Gift Shop.) 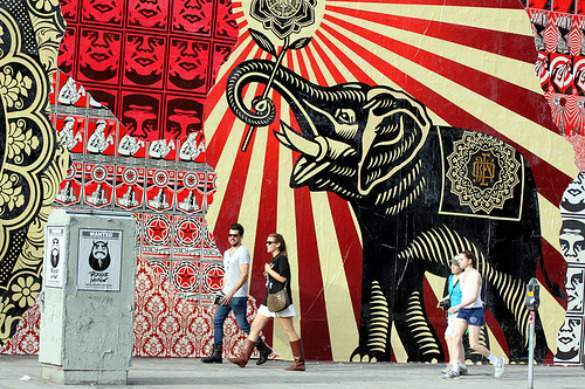 In the midst of a lawsuit over the use of an Obama image to create his Hope series, and while preparing for a gallery opening, Shepard Fairey managed to cover a wall on Melrose Avenue with some of his best-known images (above). A city with such an active street art community has pieces everywhere: East LA, Hollywood, Silver Lake, along La Brea, beneath the omnipresent overpasses (good spots for sprawling murals, some by famed muralist Retna). Depending on the artist and location, he or she may be looking to score a lucrative gallery show, demarcate a territory, exert control over a changing environment, echo the graffiti of years past, or all of the above. A wall by an artist known as Evol FlyID illustrates what’s possible with a few cans of spray paint, for decades the primary means of making LA street art. Known as “Sampa,” South America’s most populous city features lots of very big, collaborative murals, as in a large wall with pieces by Nunca, Vlok, Nina, and Os Gêmeos. Artists come to São Paulo to both play and display. 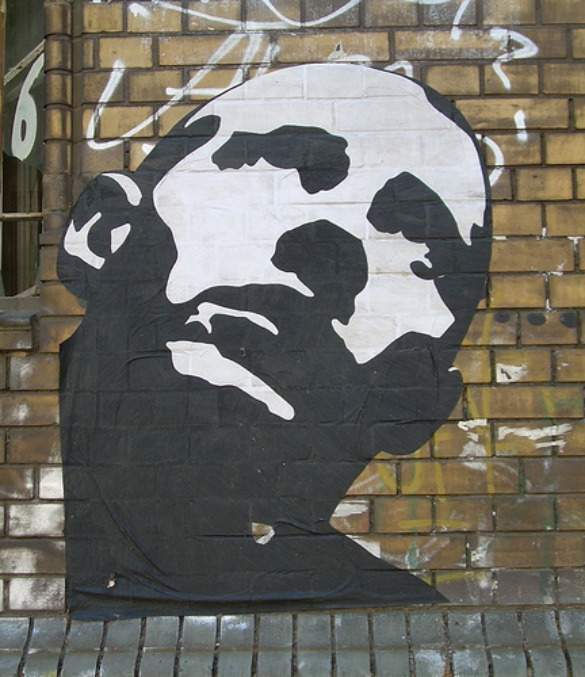 Paris-based C215 has put up several solemn portraits. In 2008, Eric Maréchal (also known as urbanhearts) began pasting other artists’ work as he traveled around the world; as part of his Street Art Without Borders project, recently he put up lots of pastes here, including edgy skeletons and women in pinup poses by German artist Mittenimwald. In terms of local artists, the influence of pichação, a type of graffiti that uses single colors and cryptic writing, appears in the drippy, fractal-like pieces by Zezão and long loopy lines of Bárbara Goy. Titi Freak’s stencils often combine hues and patterns. Urso Morto captures cartoony teddy bears in death throes. Perhaps paradoxically, one of the best districts for urban art, Pinheiros is also one of the city’s wealthiest. Praça Rooselvelt (sometimes called Crackolandia) has a rotating display of murals, posters, and stencils. 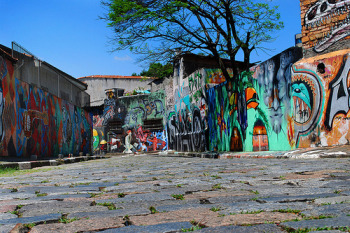 (Above right) Riotous color covers almost every inch of Beco do Batman (Batman’s Alley) in Vila Madalena, probably the city’s most-tagged area. Whereas the murals in São Paulo tend to have a whimsical bent, those in Cape Town usually immortalize key figures, including Nelson Mandela; tell stories about past events, including apartheid; or depict positive role models, as on the above wall in District Six. 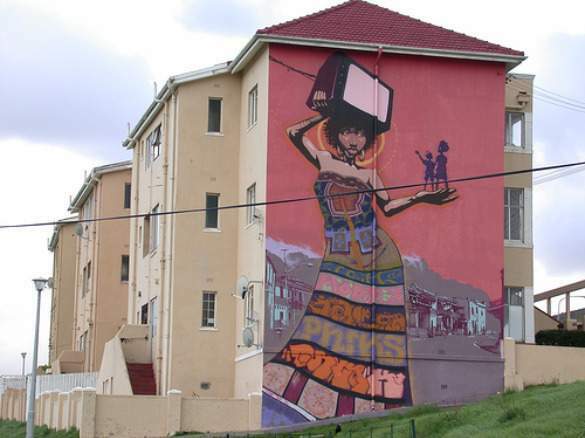 Work in Cape Town shows how street art can be used to enlighten, edify, and empower. It can help combat apathy by inspiring pride and bringing joy. Along with Faith47, Mak1One was commissioned by the Human Rights Media Centre to cover its building with a work dedicated to the rights of refugees. Faith47, who occasionally paints with her son, also does loose-limbed characters (which become stand-ins for the artist, in some cases), slogans, and razor-sharp tags. Posters by Sindiso Nyoni combine images and text to inspire people out of placidity; currently he and fellow illustrator Kronk are bringing a street art sensibility to the advertising work they’re doing as part of the upcoming World Cup. The City Bowl, including suburbs Oranjezicht and Gardens, is a good place to find pieces. And, as the wall to the right illustrates, there’s a less serious side to South African street art, relying on self-portraits, characters, and crazy animals. 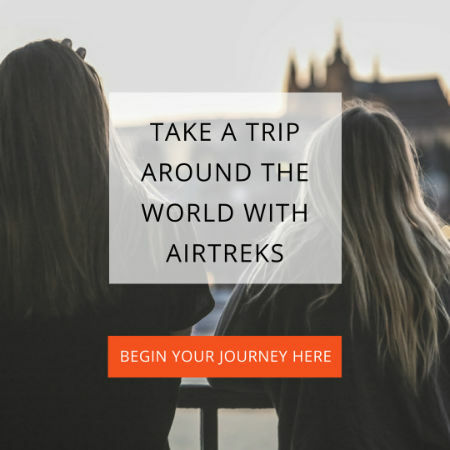 >> Search for affordable flights to South Africa, read about things to do in South Africa , and check out these Cape Town indie travel tips. omgh makes wire people (thinking, tagging, sitting, and so on) and leaves them around the city. He also does throw-ups in Persian and stickers. Stencils of growing plants by R4sh contrast sharply with the concrete walls on which they’re located. A1one’s “Evolution” shows an ape morphing into a human morphing into a soldier. Many pieces by unnamed artists get taken down before they can be documented, so the best locations aren’t widely publicized. 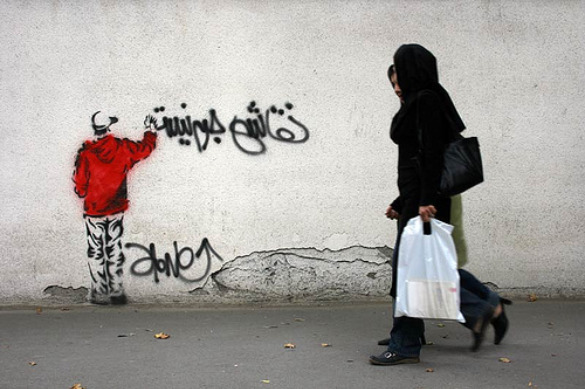 Getting caught “vandalizing” public property carries stiff penalties throughout the world, which makes the street art in Tehran all the more impressive: it shows a fierce need for self-expression, regardless of potential consequences.